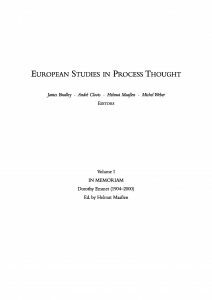 The European Studies in Process Thought is a book series devoted to the historical and systematic study of process philosophy in all its aspects. Although it is indebted to a philosophical tradition, in particular to the works of William James, Charles S. Peirce, Henri Bergson, Samuel Alexander and Alfred N. Whitehead, it is not dogmatically restricted to specific authors. It also aims at exploring various philosophical problems against the background of process thinking, i.e. the position that reality is in a continuous state of becoming and defies all attempts to provide definite and irrefutable answers or theories. In addition to philosophical monographs, the series publishes collections of peer-reviewed articles as well as the original results of conferences and symposia. Process thought is an important component of contemporary philosophy. Alfred North Whitehead’s organic philosophy has a special place in the landscape of process thinking, being detailed, precise and well-thought, and at the same time extremely visionary and far-reaching. The global community of process thinkers includes physicists, biologists, doctors, political scientists, educators, activists, philosophers, theologians and other people devoted to rethinking their disciplines in the light of process philosophy. 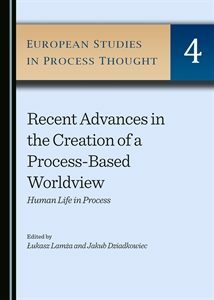 This volume presents the cutting edge in the creation of a process worldview. Leading scholars from all over the world gathered to discuss how process thinking can inspire us to rethink our lives. Precise philosophical language and a unifying vision are applied to core issues, such as politics, society, education and religion. The book represents a bold move from academic philosophy into the realm of actual human lives. This volume brings together the proceedings of the “European Summer School for Process Thought”, which took place in Mülheim, Germany, in August 2012. It explores Alfred North Whitehead’s thinking in different fields of science, connecting his philosophical writings with physics, religion, education, psychology and aesthetics. The first part of the book is concerned with Whitehead’s philosophical methodology, discussing a plethora of subjects, including the interdependence between some of Whitehead’s works, the role of logic in his style of argument, concepts of time, the role of symbolism, and the relation between specialized terminology and the colloquial in Whitehead’s philosophy. 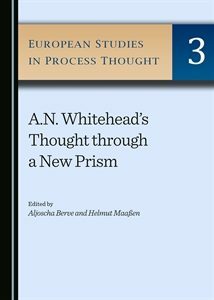 The second part explores applications for the concepts of Whitehead’s thinking in a broader context. In scientific fields as diverse as physics, theological and classical Chinese religious thought, concepts of education and psychological theories of embodiment, Whitehead’s basic philosophical concepts have been implemented in various different ways. As such, this book holds an interdisciplinary appeal for Whitehead scholars from different scientific backgrounds. One of the most important characteristics of present day ontological research is the growing interest in, and emphasis on, the dynamic aspects of being and the process-relational character of being itself. However, many important questions still await detailed answers. For example, what is the meaning of the concepts of “dynamics,” “dynamicity,” and “dynamic ontology,” among others? Are they identical to, or similar with, respectively, “processes,” “process ontology,” “process-relational ontology”? Is “process ontology” a type of “dynamic ontology”? 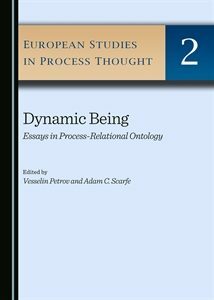 Dynamic Being: Essays in Process-Relational Ontology examines these and many other questions, and suggests fruitful approaches in dealing with such questions. The book carries out two main tasks: first, investigating developments in the theory of dynamic and process-relational ontologies, and, second, exploring developments in the application of these ontologies. The second task is multidisciplinary in character. The authors of the chapters in this volume are specialists not only in philosophy, but also in other fields of science, including psychology, biology, mathematics, logic, and computer science, their work providing a “seed-bed” of novel possibilities for cooperative interdisciplinary research. The first volume of the European Studies in Process Thought includes Dorothy Emmet’s Notes on Whitehead’s Harvard Lectures, 1928-29 and two facsimiles of undated handwritten notes by Alfred North Whitehead.Dorothy Emmet (1904-2000), Professor of Philosophy at the University of Manchester from 1945-66, gave these Notes to James Bradley in 1998. They were taken down and typed up by her at Whitehead’s request during the time he was writing Process and Reality. She gave one copy to Whitehead and kept one for herself. Dorothy Emmet was then a Commonwealth Fellow at Radcliffe College. The Notes are published here for the first time as a tribute to the enormous contribution she made in writing, discussion, and personal example, to the study and development of Whitehead’s philosophy.